The leaves and fruit of a fallen sycamore tree (Platanus occidentalis) dangle over the Savannah River as it flows along the southwestern border of the Savannah River Site. The sycamore can live for 500 to 600 years and reach a diameter greater than that of any other North American hardwood species. It grows in all states east of the Great Plains except Minnesota. Commonly found along streams and bottomlands, it frequently is planted as a shade tree because of its rapid growth; its distinctive, white, exfoliating bark; and its broad, dense crown. The fruit breaks apart during winter, producing an average of 200,000 seeds per pound. 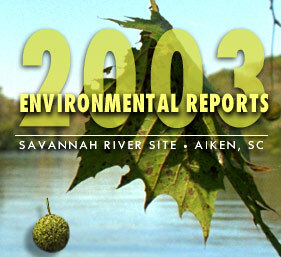 The 2003 SRS Environmental Report's interactive CD and associated web page were designed by Don Lechner and the report cover by Eleanor Justice—both of the Westinghouse Savannah River Company’s Documentation and Information Services Section - Documentation and Information Development Group. The photograph was taken by Al Mamatey of the company’s Environmental Services Section.